...so you were not sure about our extensions, or you weren't expecting to find use for them on other websites and you bought the Single Site subscription. Not to worry, we have recently added the possibility to upgrade your subscription with ease from Single Site to Multi-site just by paying the difference. This upgrade is available for licenses of the same type, meaning you can only upgrade your 12 months single site license to a 12 months multi-site one. Login with your rsjoomla.com account that stores the license. 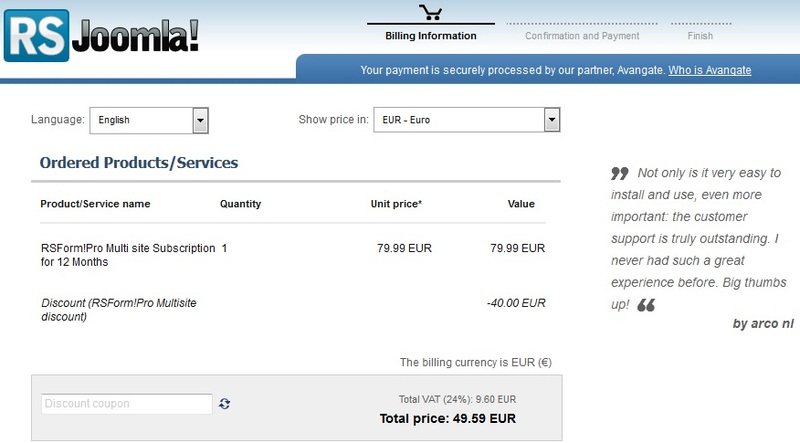 Click on the Upgrade to Multi-site button and complete confirm the payment details. Generate a license code for each domain your using the extension on so you can keep them updated and get customer support. Current promotion in place: get the 12 Months Multi-site license for the 6 months price.